A lot has been said about From Software's PlayStation 4 exclusive, Bloodborne, mostly along the lines that it looks like it should be another game in the Demon's Souls/Dark Souls series. From Software has been adamant about telling people that this game is an original IP, and a new gameplay trailer suggests that it has a lot less in common with Souls than what you might have guessed at first. For one thing, Bloodborne seems to have a set protagonist. The Souls series has always allowed you to build your undead hero from the ground up, but judging from his complicated design, I'm willing to bet that this scary dude is going to be sticking with you throughout the entire game, whether you want him to or not. 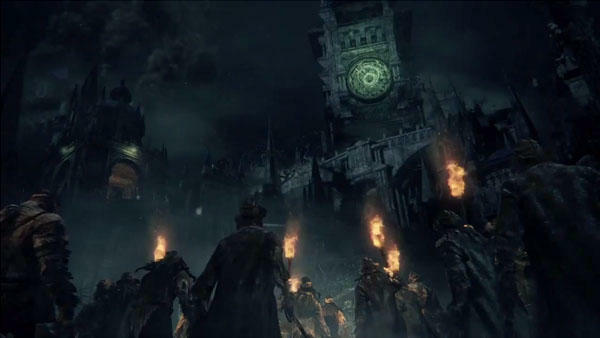 Aesthetically, Bloodborne is every bit as creepy, but in an entirely different setting. The monster designs don't vary all that much, but the human enemies strike me as very different, mostly because they actually seem more "human" than the undead, predictable soldiers from the Souls games. This Bloodborne game also puts a far more Victorian spin on its brand of horror than the more dark fantasy setting of Dark Souls and Demon's Souls. Finally, the gameplay doesn't look all that different, since both allow for slow, plodding combat, and revolve around waiting for an open chance to strike. However, this character is far more acrobatic than any character we've seen from Souls, slicing through the air and pulling off some sweet spinning combos with his weapons. Bloodborne looks like a fun little horror action game, but my biggest fear is that many will not give it the time of day simply because it is new or different from what From Software has been turning out lately. However, this game looks more along the lines of the cheap B-grade action games From Software was infamous for making before striking it big in the last several years. It's ironic considering that it was the same brand of originality that made the Souls series so popular in the face of other AAA games in the first place, but I have an unfortunate feeling that one too many people are going to shoehorn this original IP into their expectations for Dark Souls III and walk away disappointed. We'll see how it turns out, but I am far more excited for Bloodborne than I ever was for Dark Souls II. It seems like a far more genuine attempt from one of gaming's best designers to make his vision come to life, and it is a far cry from the cold and calculated sequel generating formula of modern gaming. Being free from the Souls franchise could be the best thing Bloodborne has going for it, creatively speaking.